The 115-year-old house at 1405 Front Ave. 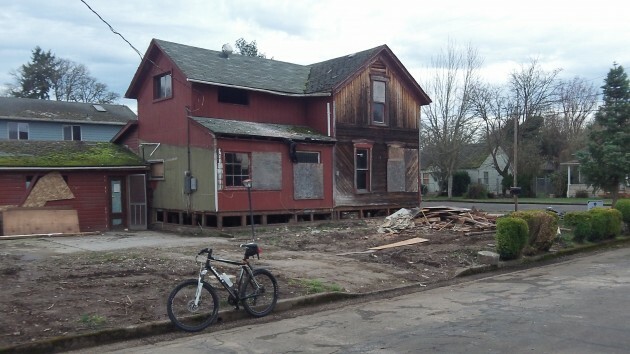 N.E., in the Willamette Neighborhood, is on one of my bike routes. On Feb. 2, I reported that it was about to undergo a renovation. Click the video for a glimpse at a drawing for the finished work as envisioned by Superior Carpentry and Homebuilding. Sean Sullivan, the firm’s general contractor, and his foreman, J.D. Harris, showed it to me when I stopped by on yet another ride Friday afternoon. They expect to get construction drawings from their architect next week so they can take out a building permit. The foundation under the front section of the old house will have to be rebuilt, but the internal “bones” of the place are sound and strong, and an inspection found no mold in the wood, Sullivan told me. A one-story section in the back of the house is where the ailing owner lived the last few years. A sign still on the door warns visitors that inside there’s “oxygen in use.” That section of the structure will be rebuilt and expanded as a two-car garage. Once the restoration and reconstruction starts in earnest — Sullivan called it a “rescue” when I talked to him before — the job should be complete in about three months. The one-story wing on the left will be replaced by a two-car garage. A house with character, I love it already! It is not being rescued, it is being destroyed. None of the original character is being saved. “Gothic”, how can you say “NONE” of the original character is being saved? How do you know? Hard to tell what remains of the original flavor. I see evidence of three additions, not counting the porch. I have to applaud someone who will attempt holding onto an old-growth structure while trying to make a profit.